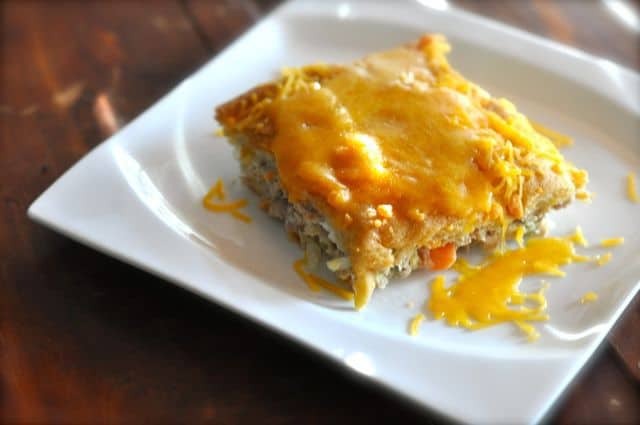 Tuna Stuffed Crescent Roll Casserole is the perfect dish for when you are making a meal for your whole family. This is easy to make dinner that you can put together in a very short amount of time. You can be very flexible in what you put in this casserole. You can have dinner on the table in about 30 minutes, with not a lot of work, this is the perfect dinner for a weeknight. Are you ever looking for an easy to put together meal for your family. This recipe can be very flexible, you can use your favorite frozen vegetables, and your favorite types of cheeses. I have made mine with a mixture of Asiago, and sharp cheddar for great results. Mix all ingredients except crescent sheets. Spray non-stick spray into a line 13x9 baking pan with one sheet. Layer tuna mixture onto the first sheet of crescent roll sheet. Top with a second crescent sheet, you can press the sheet together so it will look like one continuous sheet. bake at 350 degrees until golden brown (about 25 minutes). i usually top this with a cheese. Thanks for sharing,it sounds delicious. This sounds like a great dish. And to jazz it up a bit, make the crescent rolls individually and bake top with the cheese or maybe a good salsa. I’m gonna try this for tomorrow.Thanks for the receipt.